Once carried deadly tempests of shot and shell. Steel at a steal! This legendary box once held linked ammo to keep the M249 light machine gun (LMG) humming. Called the SAW (Squad Automatic Weapon) the gun provides a heavy volume of hellfire to protect U.S. infantry squads. And this "Fat 50" waterproof firepower carrier was the gun's best friend. Solid military grade steel construction, waterproof, ready for a second tour! 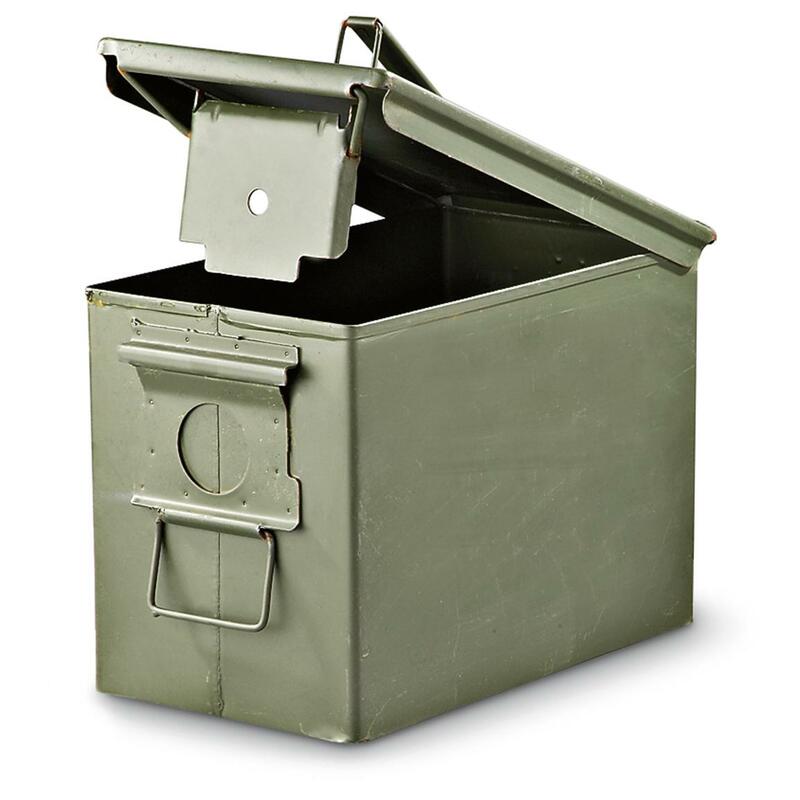 Recruit this roomy and rugged Ammo Can to keep contents bone-dry and well protected. Store your own ammo, shooting accessories, hunting gear, poker winnings, and more. Or use it in the shop to organize vital tools. It's tough as nails and priced right! Deploy this commando-tough storage solution today! Storage Capacity: 770 cu. in. Interior Dimensions: 6.75" x 11.75" x 8.25"
Exterior Dimensions: 7.25" x 12.5" x 8.5"h.
U.S. Military Surplus PA108 Fat 50 SAW Box Ammo Can, Used is rated 4.4 out of 5 by 146. Rated 5 out of 5 by notnalc from Great box, for the price Minimal rust, and no dents. I repainted it, but it didn't really have to be repainted. Rated 5 out of 5 by David D from Better shape than I expected I got the middle-grade can. One smallish dent in a corner. A little surface rust, but nothing deep. Paint in good shape. Latch functions fine. Seal in good shape. Inside smells like (a word the site won't let me use), as it should. Very happy with it, especially since it was on such a good sale. It's not as good a deal at the regular price, but at least it's American, not junk from China. Rated 5 out of 5 by red leader from Best Can in Land This ammo can is bag, and adequate for various boxes or mags of ammo! It is also convenient to carry with the usual Military carry- handles. Rated 3 out of 5 by Patrick from Decent condition but not as shown. The cans were not dented. All had surface rust. The seals had failed on two of the seven cans that I purchased. These cans had internal moisture and rust inside the can. Rated 5 out of 5 by David D from Great price and in good shape Getting genuine military steel for this price is a great deal. This was in much better shape than I expected - only a few very small spots of rust, the paint is in good shape, the gasket and buckle seem to be fine,no dents or ugly spots on mine. Great value from SG. Rated 5 out of 5 by BudS from Nice ammo cans for the price Good ammo cans w/ seal in tact. One was new, one was used, but still in excellent condition. Another quality item from the Guide! Rated 5 out of 5 by RCC3 from Nice Cans This arrived fast and in like new condition. Great for all you storage needs. Rated 5 out of 5 by tdj7777 from Ammo Can Of all the ammo cans I've ever seen, this is one of them. Keep your tools safe and dry.